GEC (Great Eastern Cutlery) would be my choice. They do short runs and are imo the closest production knife that has custom quality. It would have to have a nice quality steel to be interesting to me. If it is something like 420, I wouldn't bother with the project. I like the idea. I don't normally carry one but could ... I support the non-tactical proposal. Not much to add on design other than I prefer not super pointy tips. Sounds like a good idea like the non tactical part. what do you guys mean with non tactical? and i would never consider a knife with a pocket clip! (12-08-2015, 08:53 AM)tonsorius Wrote: what do you guys mean with non tactical? I don't like the pocket clip, unless it is a tactical knife. I think they are taking about wood/steel combo instead of black plastic handles. Count me as interested. Bone, horn, stone or wood for the scales and a quality steel for the blade. (12-08-2015, 08:53 AM)tonsorius Wrote: what do you guys mean with non tactical? and i would never consider a knife with a pocket clip! I don't like the pocket clip, unless it is a tactical knife. I think they are taking about wood/steel combo instead of black plastic handles. Or bone, horn... I have carried a knife just about my entire life. Have a Case cattleman in my pocket right now and a handful of others at home. I have a number of fixed blade, tactical knives etc. but they are purpose driven and would never carry daily. Old school, classy pocket gets my vote! Love knives, friends with a lot of the makers as well, Chris reeve, Tony marfione, Mike snody, Thomas from zt/kershaw ,Sal glessar. I'm really active in the knife community both online and in person, I'm out of the country right now but if I can do anything to help, even if it's just putting people in touch with who they need to be let me know. I'd love to get involved/purchase, but as already mentioned the UK laws are quite restrictive as to what you can legally carry! Anything interesting to most of you would probably be illegal in the UK! (12-08-2015, 08:55 AM)hrfdez Wrote: I don't like the pocket clip, unless it is a tactical knife. I think they are taking about wood/steel combo instead of black plastic handles. Thanks Hector! Simple but useful and very similar to what my Dad carried, my Grandfather before him. I have been carrying a SOG Twitch II for years. Not flashy but functional. There seems to be some pushback on a clip but I perfer a knife with one for ease of access. 2. 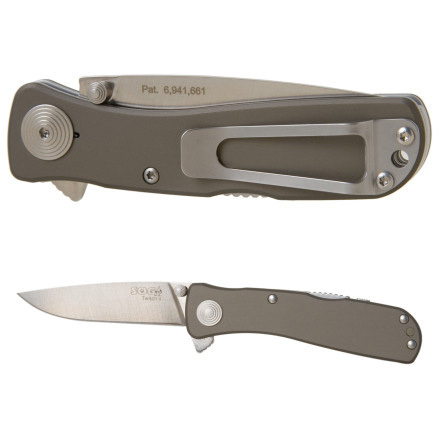 Many models to choose from that represent a "gentlemen's pocket knife". For opening packages, sharpening pencils etc. Small. 3. Several models available in carbon steel. Blade will develop patina and carbon offers ease of sharpening. 4. Case do special club runs all the time and are likely very affordable for the majority of forum members. My suggestion would be one of their "Peanuts" or the "Mini CopperLock". The Peanut is available in a rough black handled version that is reminiscent of the pocket knives known as "gum fuddy" in WW2. The Mini CopperLock is a nice single blade locking folder with many handle choices. Really slim in the pocket and not obtrusively long. 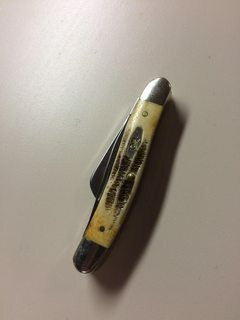 2nd on Great Eastern Cutlery slip joint.